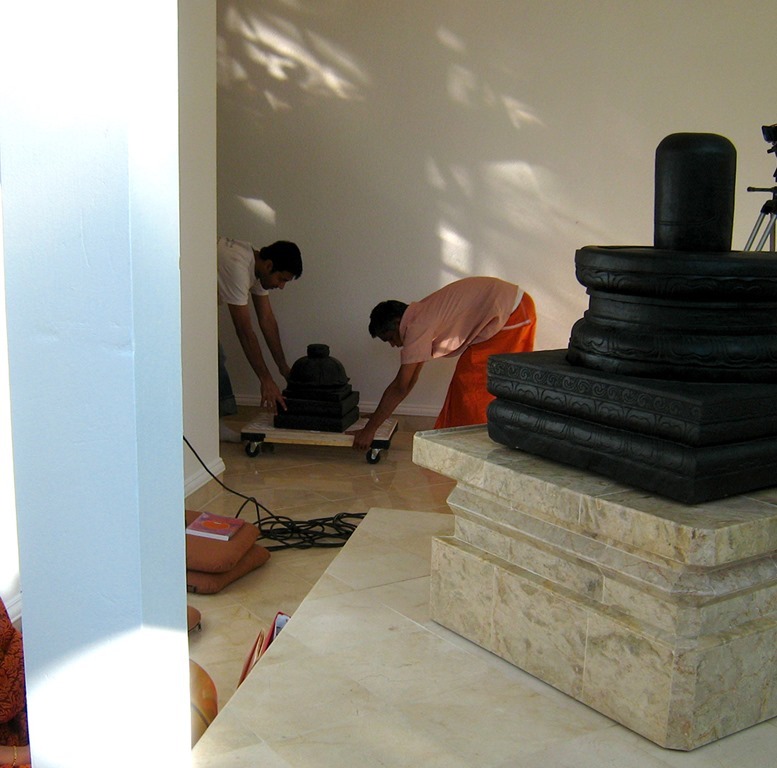 the Siva Lingam and the Murtis move to their permanent home in the Sri Sadisvara Mandiram. 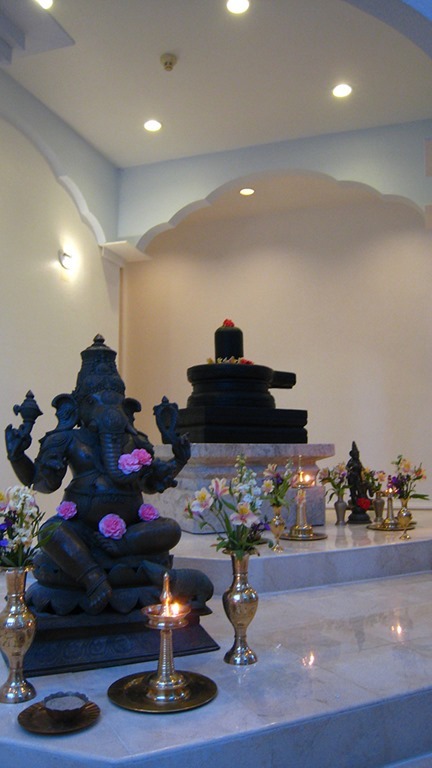 Since mid-August when the Siva Lingam, Ganapati, Skanda, Nandi, Sivakami, Chitragupta, and Balipitam arrived at the SAT Temple , they have resided, temporarily, in the Lotus Room. 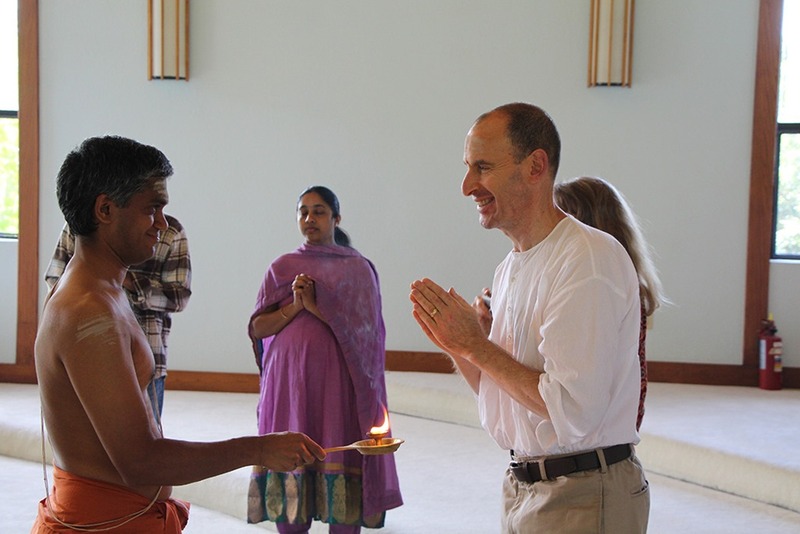 April 26 was an exciting day for devotees at SAT. 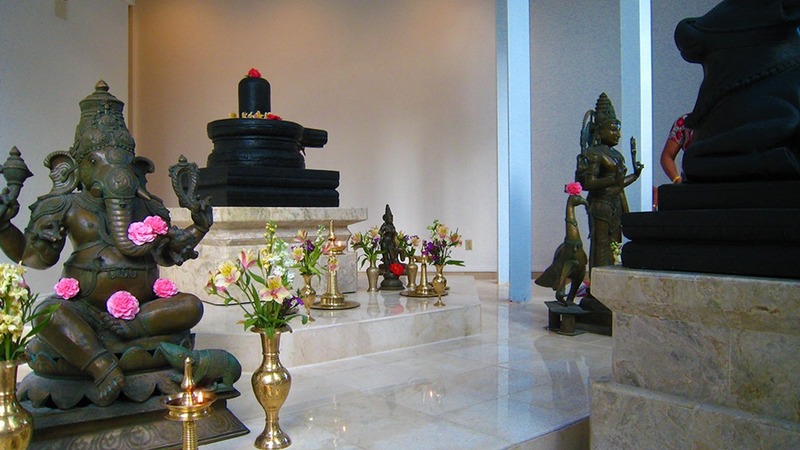 The Siva Lingam and the Murtis were moved to their permanent home in the Sri Sadisvara Mandiram. The day was a blissful, sacred day for devotees. The atmosphere was thick with devotion, drenched in a holy vibration, and permeated by Sri Bhagavan. Below are images to share with you showing this blessed event. 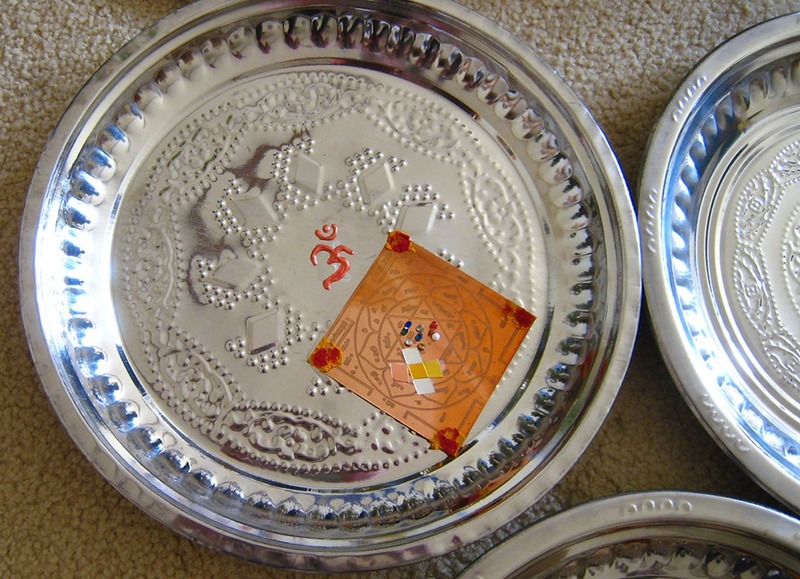 Above, Dhanya prepares the trays for Yantram and Navaratnam to be placed under the Siva Lingam and Murtis. 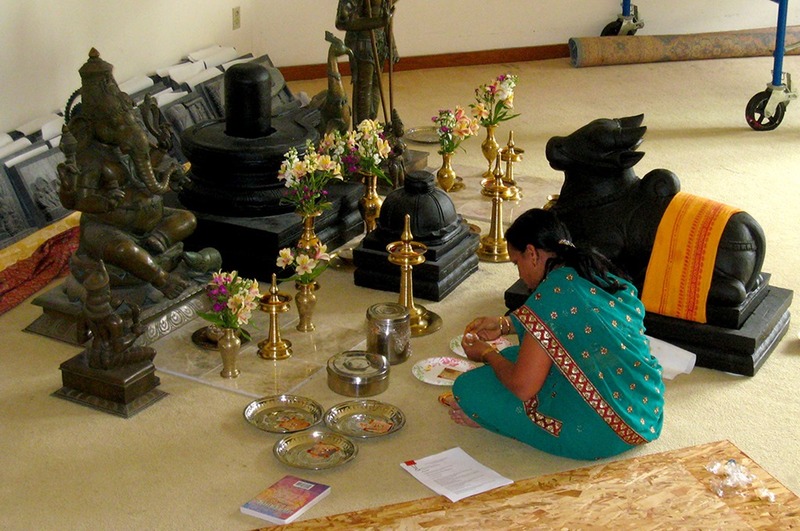 Below, Sangeeta prepares the chants that will be sung during the Pratishta. …one for Siva Lingam, one for Ganesha, one for Skanda, one for Sivakami, one for Nandi and one for Balipitam. 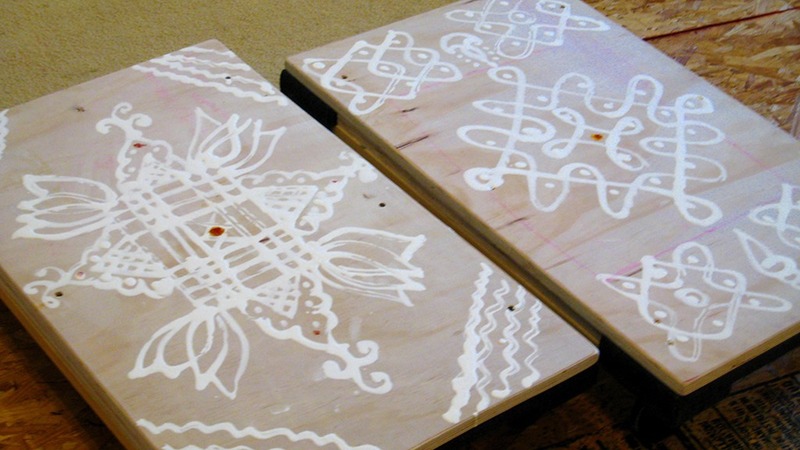 Dhanya paints kolams on the threshold leading from the Lotus Room to the Mandiram. 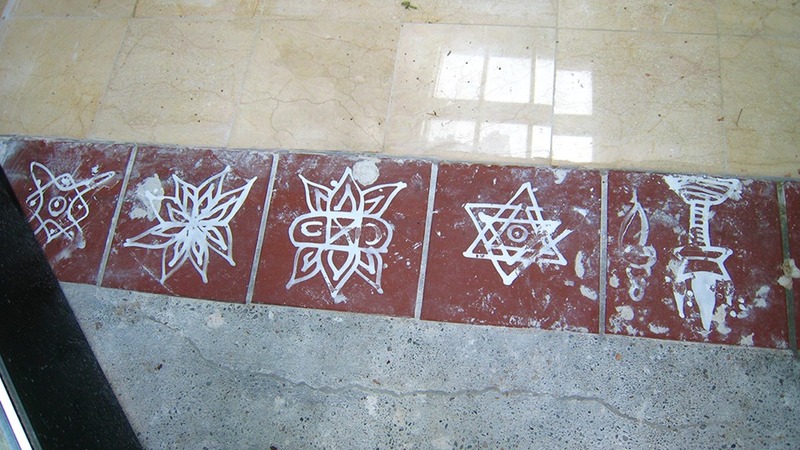 More kolams are painted on the threshold leading from the outside front entry of the temple into the Mandiram. First, devotees gathered in the Satsang Hall for puja to Sri Bhagavan. 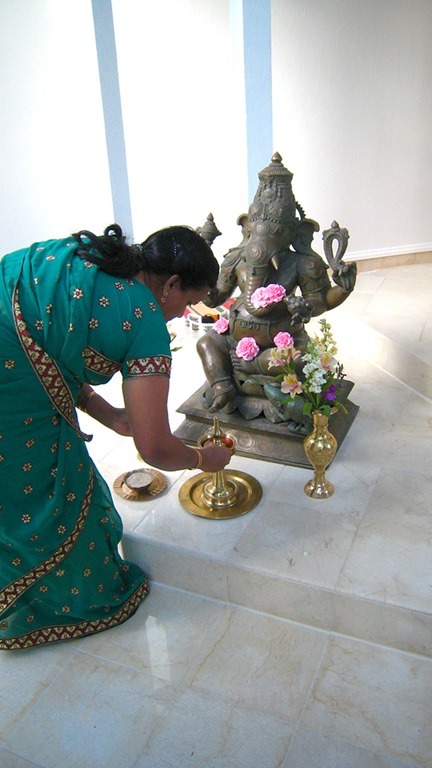 Then, all devotees move to the Lotus Room for puja to Sri Ganesha to sanctify and assure the Pratishta goes well. 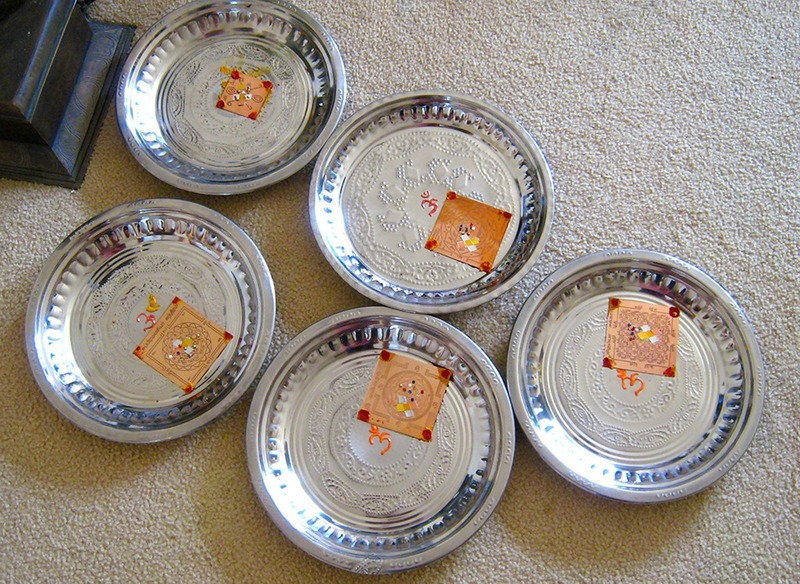 This a traditional sixteen step puja. 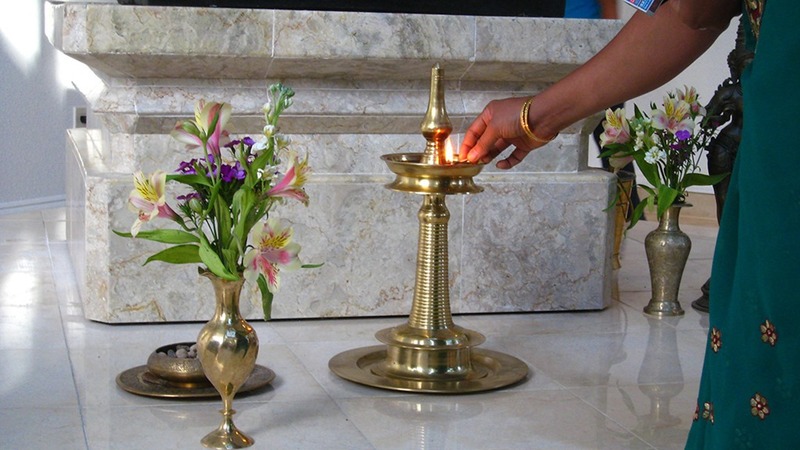 After the Ganesha Puja, camphor flame is offered to all devotees followed by anganyasam (invoking God in the various limbs of the body) on Sri Sadisvara gayatri is done. 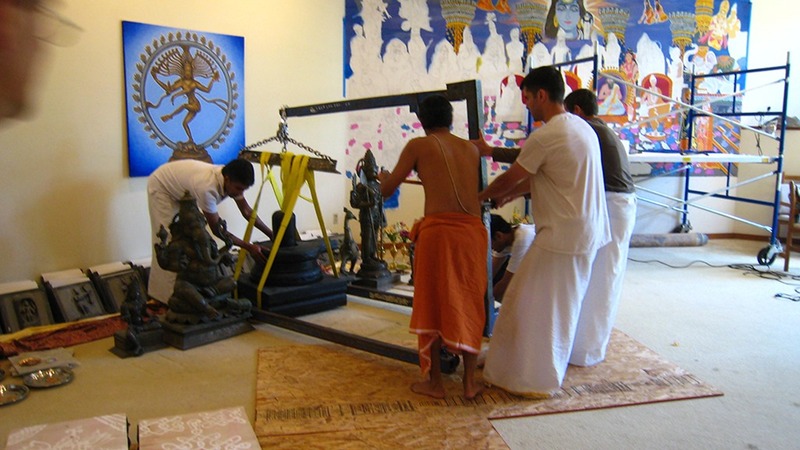 Gnana and Ganesh place planks upon which the hoist holding the Siva Lingam will be moved. 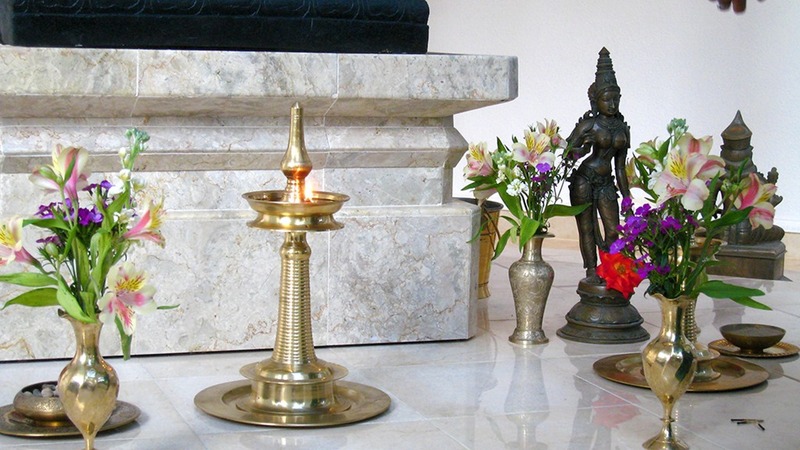 First, the Yantram and Navaratnam are carefully placed under the altar of the Sri Sadisvara Siva Lingam. Devotees chant Sadisvara gayatri while performing this. 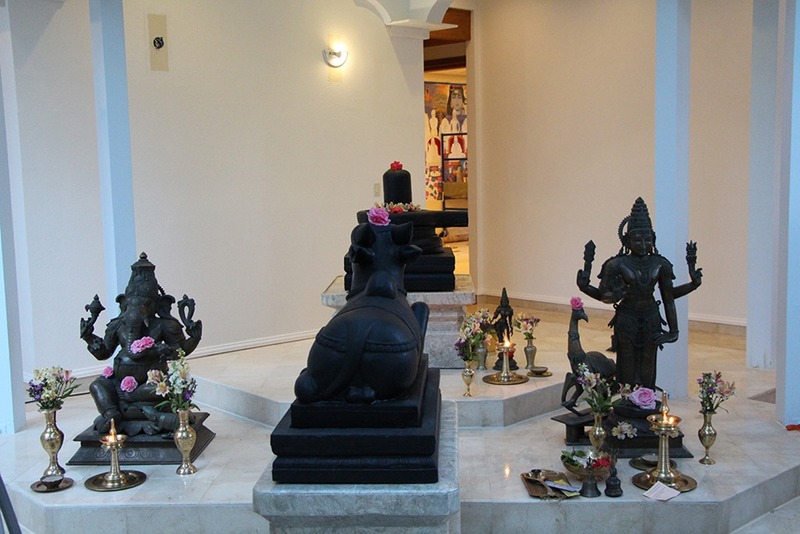 In the Lotus Room, Nandi and Balipitam need to be moved to make way for moving the Siva Lingam. Nome looks on in the background. 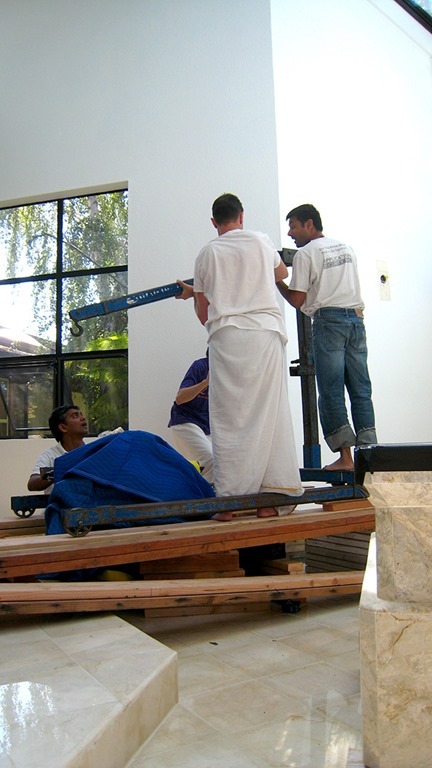 The hoist gets kolams as well to assure safe moving. Nandi is lifted and moved back out of the way. 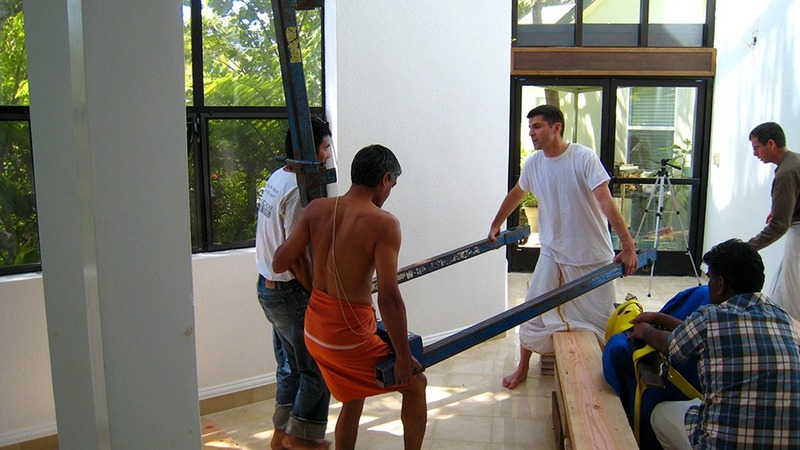 Next Balipitam is moved back. Now, there is room to move the Siva Lingam. Plywood is laid upon the carpet for easy rolling. 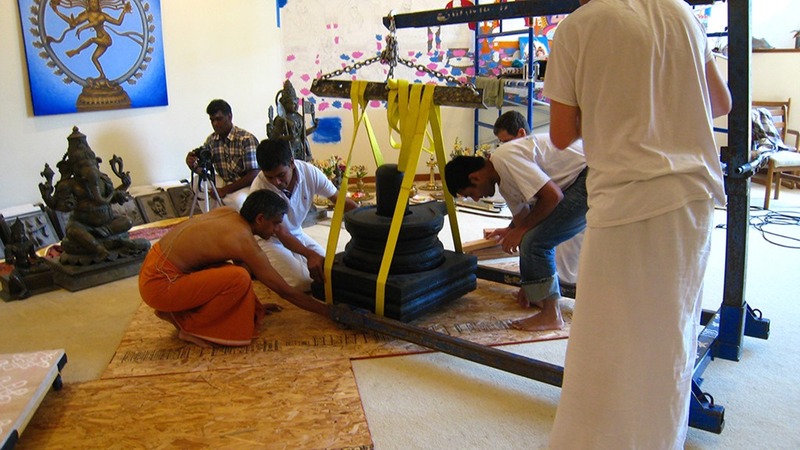 The hoist is put into place and the straps are wrapped around the Siva Lingam. 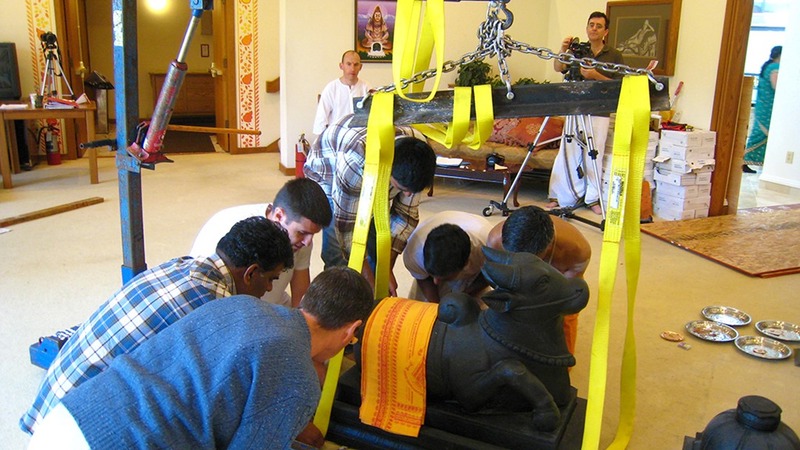 Ganesh uses a crow bar to lift the Siva Lingam while straps are scooted underneath. 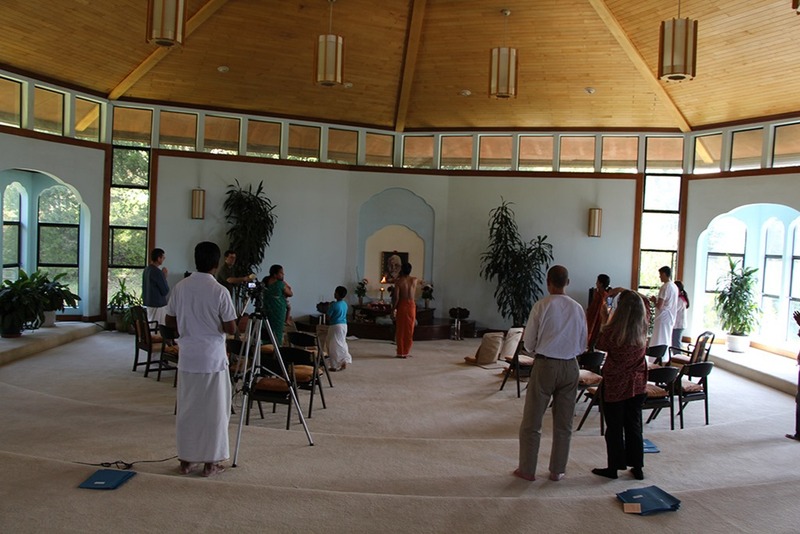 All the while the moving is taking place, Jaya, Dhanya, Sangeeta, Anandhi, and Prema chant in the Mandiram. The Siva Lingam altar is visible here. 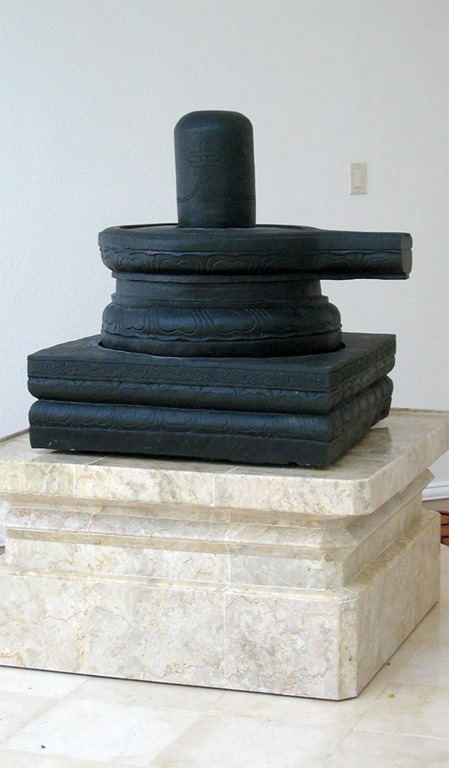 Black tape has been placed along the edges to protect the altar while the Siva Lingam is being lowered onto it. 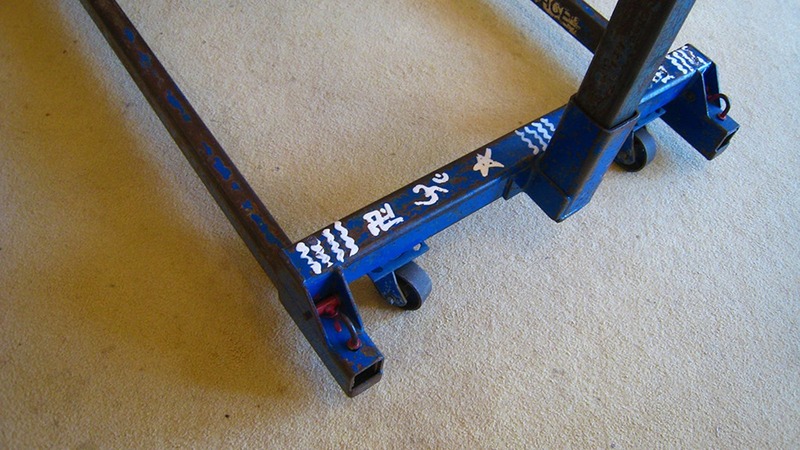 Dhanya also paints kolams on the carts upon which the Siva Lingam and Murtis will be rolled. 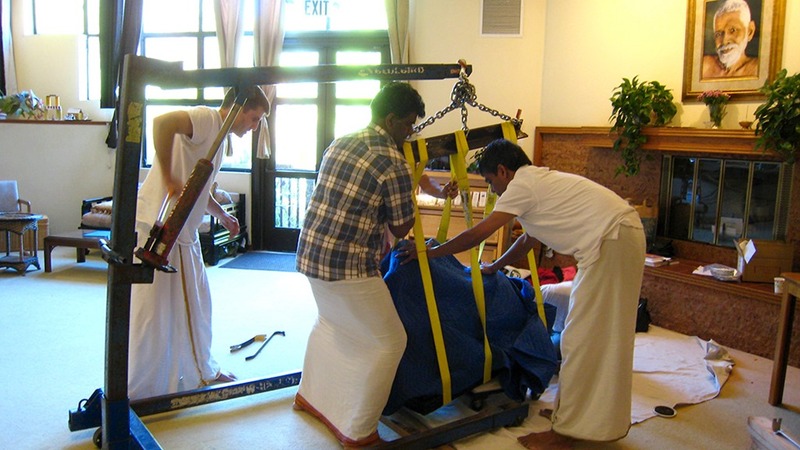 The hoist lifts the Siva Lingam onto the cart. The Siva Lingam is wrapped in a blue blanket for protection. 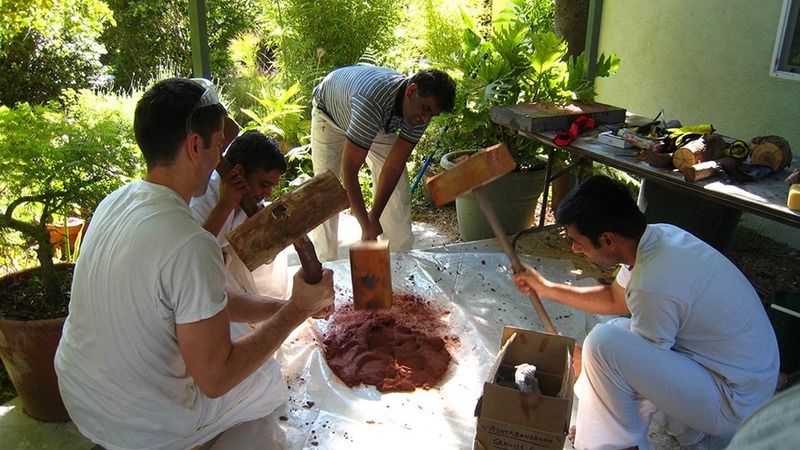 Scott, Raman, Ganesh, Tim and Gnana roll the Siva Lingam on the cart into the Mandiram. Here, young Advait helps push, too. Around the corner and into the Mandiram. 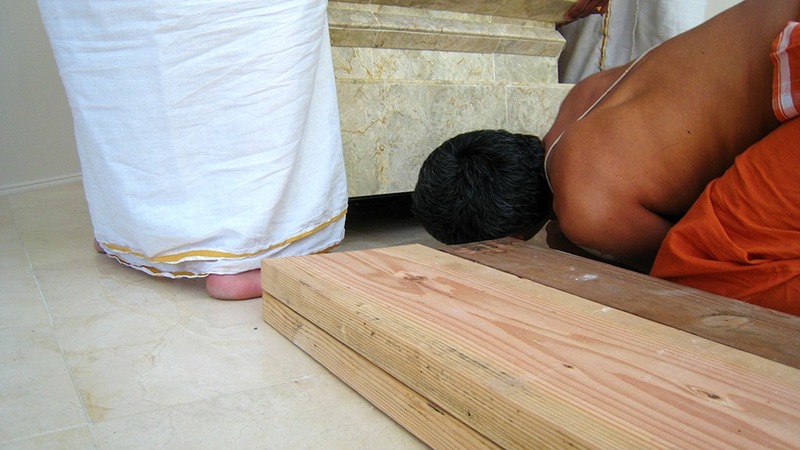 More plywood is placed for the Siva Lingam cart to roll upon. 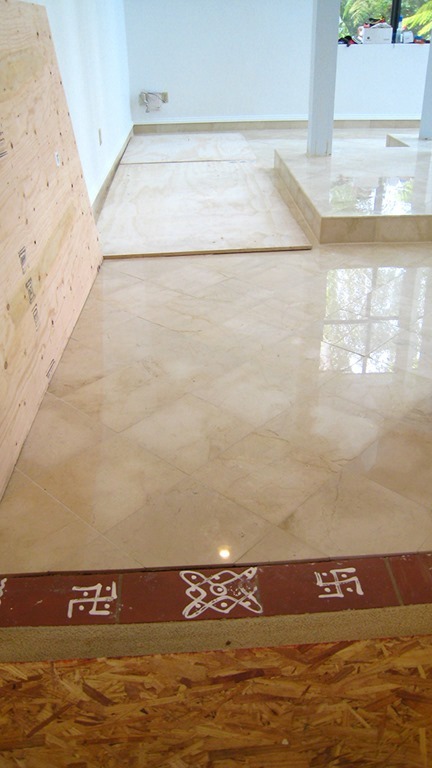 This is done to protect the marble floor from the weight of the Lingam. 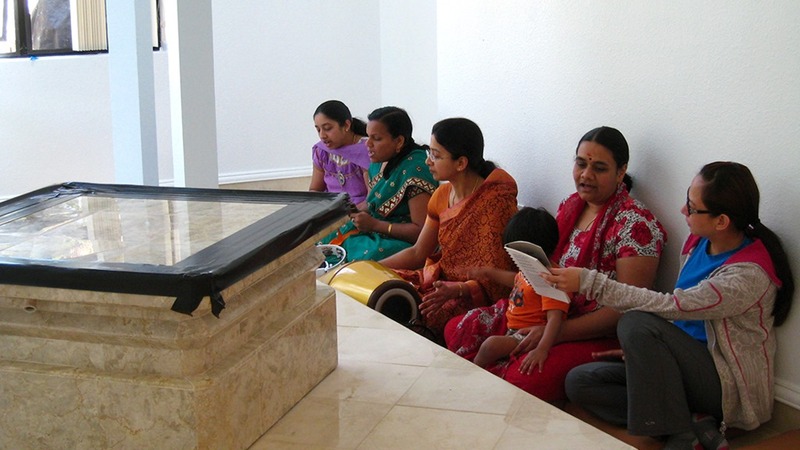 Everyone stops to discuss the best possible means of moving the Lingam. All the while, the ladies are chanting in the background. The Siva Lingam is in place on the cart. Now, planks are put in place to hold the hoist. 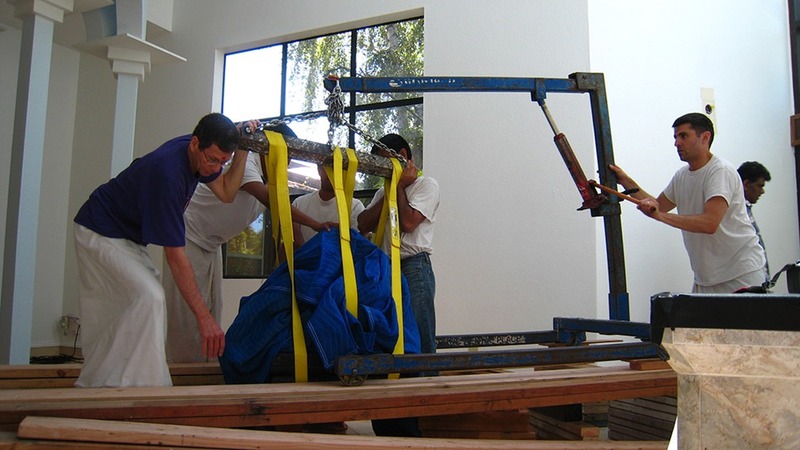 The hoist is placed on the planks. 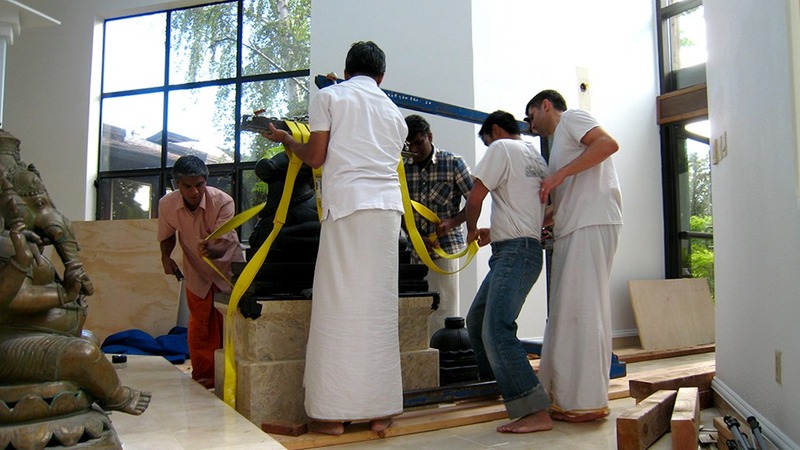 The Siva Lingam is now strapped again to the hoist and lifted from the cart. 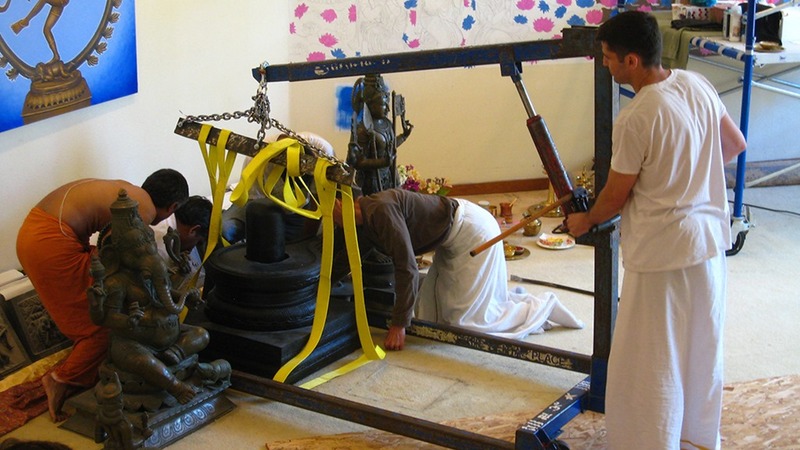 …the Siva Lingam is placed upon its altar and the hoist, straps and blanket are removed. 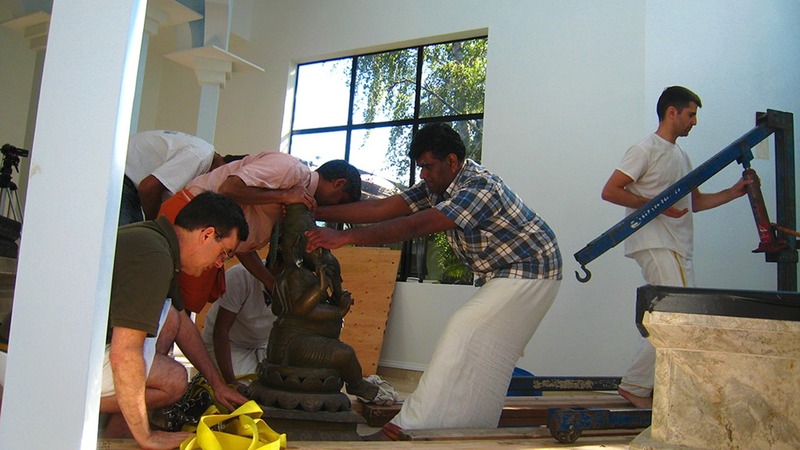 Next, Ganesha is placed in the Mandiram. 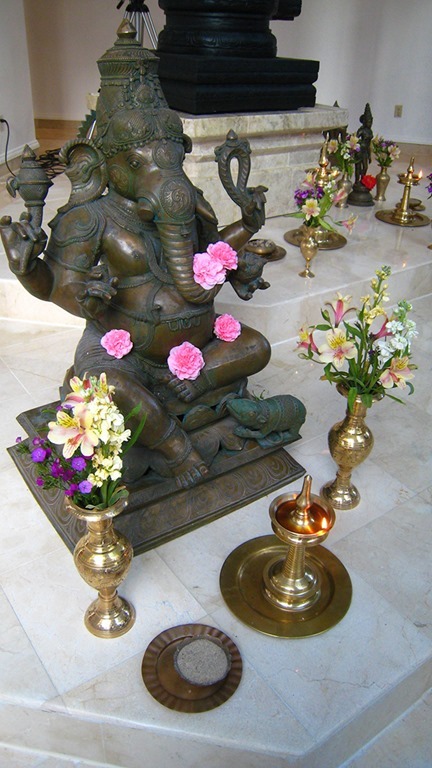 Yantram and Navaratnam are placed under Sri Ganesha and devotees recite verses and stotrams from various texts: Ganesa gayatri; Ganapati Upanishad (below); Ganesa panacratnam. Om O! deva-s, may we hear the auspicious with our ears; may we see the auspicious with our eyes, that which is worthy of worship. With firm/healthy limbs, with satisfied body, may we spend/enjoy life up to that age agreeable to the deva-s. May Indra, possessed of great swiftness, bless us. May Pusa, (Sun god) the one embracing all things, bless us. May the enemy of Taksaka, Aristanemi, bless us. May Brihaspati grant us blessings. Om peace! peace! peace! 1. Om prostration to Ganapati. You, indeed, are the clear/distinct/real truth. You, indeed, alone are the maker/creator. You, indeed, alone are the bearer/preserver. You, indeed, alone are the destroyer. You, indeed, are verily all; you are all-this-is-Brahman. You are eternally really the Self. 2. I say what is right (the truth). I say what is true. 3. Be you pleased with me. Be pleased with the speaker. Be pleased with the listener. Be pleased with the giver. Be pleased with the creator. Be pleased with the one devoted to learning (learned in the Vedas). Be pleased with the disciple. Be pleased with the west. Be pleased with the east. Be pleased with the north. Be pleased with the south. Be pleased with the above, also. Be pleased with the below. Protect me; protect me completely from all sides. 4. You are the essence of speech. You are the nature of Consciousness. You are the nature of bliss. You are the nature of Brahman. You are the nondual nature of sat-cit-ananda (Being-Consciousness-Bliss). You are the clear/real Brahman. You are the nature of Knowledge and awareness. 5. This entire universe is brought forth from (produced by) you. This entire universe resides in you. This entire universe will dissolve in you. This entire universe returns to you. You are earth, water, fire, wind, space. You are the four states of speech (para, pashyanti, madhyama, vaikhari). 6. You transcend the triad of qualities. You transcend the triad of states. You transcend the triad of bodies. You transcend the triad of time. You eternally abide as the root substratum. You are of the nature of the triad of Sakti. You are meditated upon by Yogi-s eternally. You are Brahma. You are Visnu. You are Rudra. You are Indra. You are Agni. You are Vayu. You are Surya. You are Candra. You are Brahman—earth, sky, heaven. Om. 7. Having uttered “gaNa” first, then varna-s (alphabets) and such. anusvara-s further later. Brought to light by crescent moon. Resounded by the stars. This is your wise/intelligent form. “Ga”-kara is the first part, “a”-kara is the middle part, anusvara is the last part. “bindu” is the superior form. “nada” is the link. “sagMhita” is the sandhi (junction). This is “Ganesha Vidya”. Ganaka is the Rishi, nicRdgayatri is the Chandas (3 x 8 syllables). Ganapati is the God. “AUM GaMGaNapataye Namah” . 8. To that one-tusked one we know; to the One with a curved trunk may we direct our minds (meditate). May that tusked one inspire (impel) us. 10. Prostration to the Lord of the assemblage. Prostration to the Lord of the gana-s. Prostration to the Lord of pramatha-s. May this salutations be to you the potbellied, the one-tusked, the destroyer of obstacles, the son of Siva, the form granting boons, prostration. Now Skanda is placed in the Mandiram and Yantram and Navaratnam are placed under him. 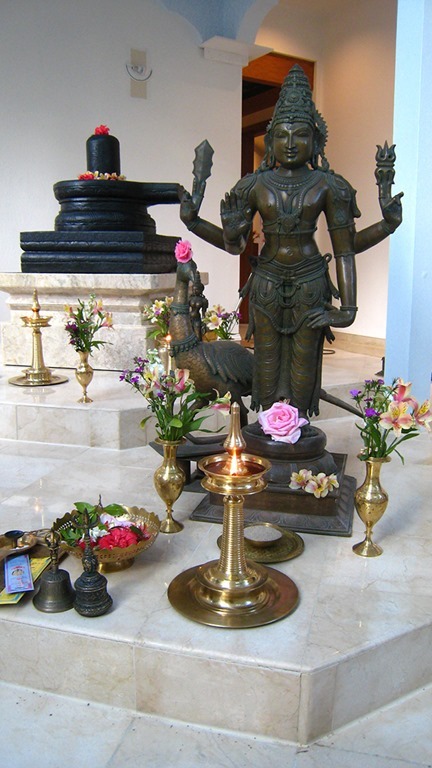 Devotees recite verses and stotrams from various texts: Subramania gayatri; Skanda Upanishad (below); Subramania Bhujangam. 1. I am imperishable (solid), Mahadeva (Great God), by a small portion of your compassion (kindness). I am a mass of Knowledge (vijnana) alone. I am Siva. What is beyond (higher than) this? 2. What is not innate appears as if one’s own because of the swelling (yawning) of the inner organ (mind, antahkarana). By the destruction of the antahkarana, Hari abides as only Consciousness (Samvit). 3. As I, also, abide as Consciousness (Samvit), I am unborn. What is higher than (beyond) it? All that is different (separate) is inert and, like a dream, vanishes (is destroyed). 4. He who, indeed, is the seer of the conscious (cit) and the inert (jada) is Acutya (imperishable, Vishnu), and is of the form of Knowledge (Jnana). He alone, indeed, is Mahadeva. He alone, indeed, is Maha-Hari (Mahavishnu). 5. He alone is the Light of all lights. He alone is Paramesvara (the Supreme Lord). He alone, indeed, is Parabrahman. That Brahman I am. There is no doubt (of this). 6. Jiva is Siva. Siva is jiva. That jiva is Siva alone. Bound by husk, it is rice paddy; by becoming free from the husk, it is rice. 7. Thus, just so, the jiva is bound. [If] karma is destroyed, [he] is Sadasiva (always Siva). So long as he is bound by the bond (fetter), he is jiva. Liberated from the bond, he is Sadasiva. 8. [Salutations] to Siva, to the nature of Vishnu (the all-pervading one); [salutations] to Vishnu, to the nature of Siva. The heart of Siva is Vishnu. The heart of Vishnu is Siva. 9. As Vishnu is the nature of Siva, Siva is the nature of Vishnu. As I see no difference (distance, exterior, interior), therefore for me are well-being and long life. As within, there may be no differences, just so is it with Siva and Keshava and happiness. 11. The revelation of non-difference is Knowledge (Jnana). Meditation is the mind having no dwelling place (supportless, free from attachment to sense objects). The ablution (bath) is abandonment of the dust of the mind. Purity is the seizure (restraint) of the senses. 12. The immortal nectar of Brahman should be drunk. One should go about begging alms for the care of the body. One, devoted to the One alone, having been in a solitary place, should dwell devoid of duality. Thus should the wise one conduct himself. 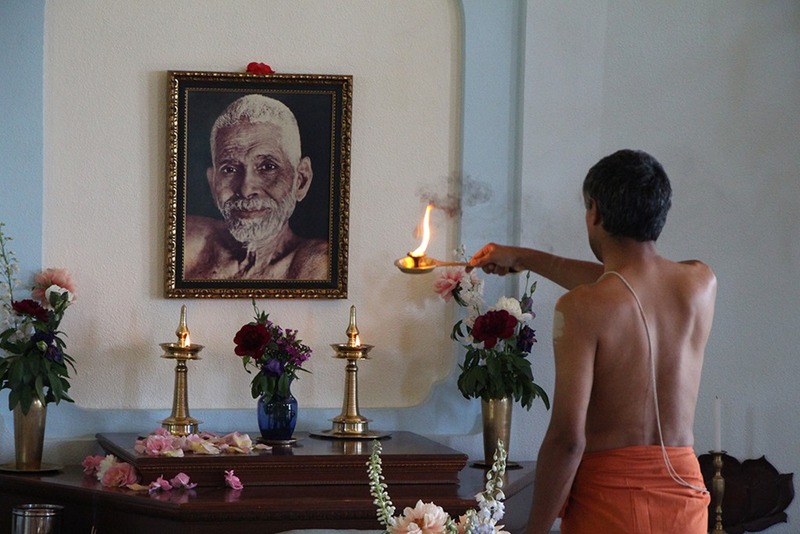 He thus will attain Liberation. 13. For the holy, supreme abode, well-being, and long life, salutation thus. Of the nature (the Self) of Brahma, Narayana, and Sankara, Narasimha, the Lord of the Gods, bestowing grace, unthinkable, unmanifested, infinite, immutable, the Self of the Vedas, Brahman, the innate (the constant) is known. 14. That Vishnu, the Supreme abode (state, padam), the wise see always, like [with] the eye extended to heaven. 15. By that stretching out of the sages, joyfully, wonderfully awake, is kindled the supreme abode (state, padam) of Vishnu. Thus, this is the instruction about Nirvana; thus is the instruction of the Veda; thus is the Upanishad. Here, Gnana and Siva carry Skanda’s mount, the peacock. 2. She answered: I am the true nature of Brahman. From me is the universe that consists of prakriti (manifested nature) and purusha (spirit) and the void and the non-void. I am bliss and non-bliss; in awareness (vijnana, knowledge) and unawareness I am. Brahman in Brahman is to be known. Thus, indeed, [declares] the Atharva scripture (shruti). 3. I am the five elements and also what is other than the five elements. I am the entire universe. I am the Veda, and I am what is not the Veda. I am knowledge (vidya), and I am non-knowledge (ignorance). I am the Unborn, and I am the born (lit. not unborn). Below, above, and across I am. 6. To the zealous (attentive) worshipper who sacrifices, offering oblation and extracting the Soma juice, I grant substantiality (power, dravinam). I am the ruler bringing union (gathering together) of the excellent ones (of the Gods); I am the yoni (womb, origin, repository, resting place, abode) [in which] heaven and the head are well-woven in the water in the inner sea. Or: I am the yoni (womb, origin, repository, resting place, abode), the well-woven (in the powerful water), heavenly summit in the water of the inner sea. 7. One who thus knows attains the abode (foot) of the Goddess. 8. They, the Gods, said: Salutation to the Goddess, to the great Goddess! To Sivaa (the auspicious) salutation constantly and always. To blessed Prakriti, salutation! Ever to Her we bow [with hands] together. 9. She is the color of fire, burning with tapas, the resplendent (sun-like) Goddess, pleased with (propitiated by, wished for by) actions’ fruits. For refuge, I resort to the inaccessible Goddess (Durga-devi), still more, [and] darkness is destroyed. 10. The Gods created (gave birth to) divine speech, [yet] She, who is the form of the universe, [all of] the herd speak. Speaking pleasantly to us, the powerful Lord, with power and strength, [may She] aptly draw, as from a cow, the milk of excellent speech. 11. To [Her], the dark night, praised by Brahma, belonging to (devoted to, worshiper of) Vishnu (the all-pervasive One), the mother of Skanda (the attacker), Sarasvati (the flowing one, fluid), Aditi (freedom, boundlessness, “eternal and infinite expanse”), Daksha’s (adroit, intelligent, heightening the intellect) daughter, we offer salutations, to holy Sivaa. 12. We know great Lakshmi (Goddess of good fortune and beauty). On all-accomplishment we meditate. May that Goddess inspire (impel) us! 15. …This is the power of the Self, universally bewildering…This is the great, holy Knowledge. 16. One who knows thus crosses over grief. 17. Divine Mother! May this salutation be to you. Mother, protect us in all possible ways. 18. She, here, is the eight Vasus, the eleven Rudras, the twelve Adityas. She, here is all of the Gods, those who drink Soma and those who do not. She is the yatudhana-s (evil spirits), the asura-s (demons), the raksha-s (evil beings), the ghosts, the yaksha-s (semi-divine beings), and the siddha-s. She is sattva, rajas, and tamas. She is Prajapati (progenitor), Indra (chief of the Gods), and Manu. She, here, is the planets, the stars, and the luminous spheres. She is the divisions of time and the form of time. I salute Her ever. 19. She is the Goddess who banishes distress, grants enjoyment and Liberation, infinite, victorious, pure, the refuge, the giver of good, Sivaa. 25. I bow to you, Goddess, you who destroy great fear, the great tranquil inaccessible one (Durga); the extinguisher of great difficulties), of the form of great compassion. 26. Brahma and others know not her true nature; so she is called the Unknowable. Of Her no end is found (exists); so she is called the Endless (the infinite). Of Her a grasp is not obtained; so she is called the Invisible (the mark-less). Of Her, birth is not obtained, so she is called the Unborn. One alone exists everywhere, and so she is called the One. One alone is all forms, and so she is called the many. For these reasons, indeed, she is called the Unknowable, the Endless, the Invisible, the Unborn, the One, and the many, thus. 27. The Goddess is the mother of all mantras. Of words (sounds), the knowledge is her form. Of [all] knowledge, she is of the nature of transcendent Consciousness. Of the voids, she is the witness. 28. Beyond her is nothing. She, here, as “Inaccessible (Durga)” thus is proclaimed. To Her, Durga, the inaccessible Goddess, the granter bestowing good conduct, I, frightened of worldly existence, bow (offer salutations), to the one who enables [me] to cross over the wavy sea of samsara. …and placed in position behind Nandi’s altar. 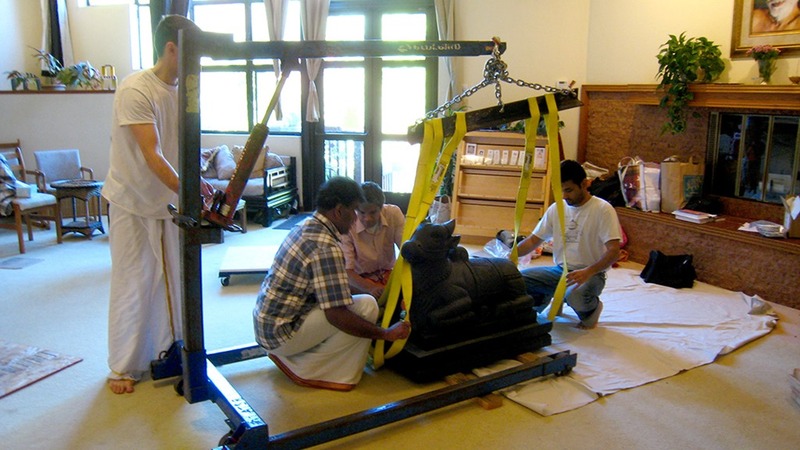 And finally, it is Nandi’s turn to be moved into the Mandiram. 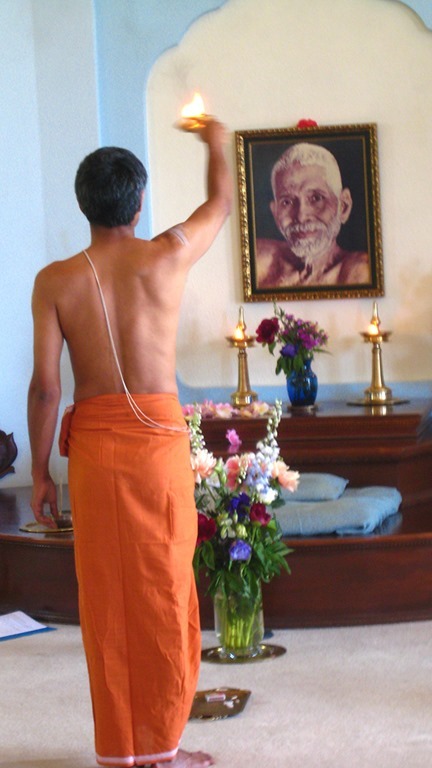 All the while, all day, while all the moving is going on, devotees are singing and chanting. Nandi is also covered in a blue blanket for protection. He is placed upon a cart and rolled into the Mandiram. Again, he is strapped to the hoist and lifted upon his altar. Everyone is in the Mandiram now, the move is complete. We began at 11:00 a.m. and finished in the early evening. Dhanya lights the lamps and flowers are placed. 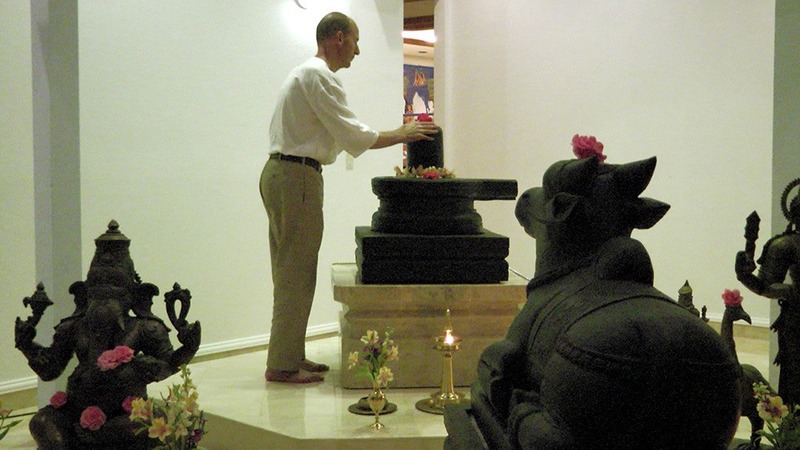 Nome places his hands upon the Siva Lingam sanctifying the Sri Sadisvara Mandiram. “This is first of the articles regarding material design in Traditional Knowledge Systems of India. The most interesting among these might be the natural composite adhesive used in temples of south India. Known as ‘Ashtabandham’, this natural composite is used to fix the ‘vigraham’ (idol) to the ‘peetham’ (base/seat). Ashtabandham is a Sanskrit word and means a mix (bandham) of eight (ashta) ingredients. The process of applying ashtabandham to the idol is done every 12 years and is known as ‘Ashtabandha-kalasam’. This process is widely seen in temples of Kerala. Preparing the mixture which serves as an adhesive is a 41-day long procedure and the eight ingredients that go into it are finely powdered conch, gall-nut, sealing wax, gooseberry, resin of ‘pinus dammar’, two varieties of gravel from the Bharatapuzha (a river in Kerala, India) and the confluence of three rivers (Triveni) and cotton. It is only in the final stage of the preparation in the temple that cotton is added to the mixture. All these ingredients have their own latent sticky consistency and the process of hammering them into the appropriate texture is done with the help of five wooden hammers, each hammer head weighing ten kilos. The mixture is sieved through a fine muslin. 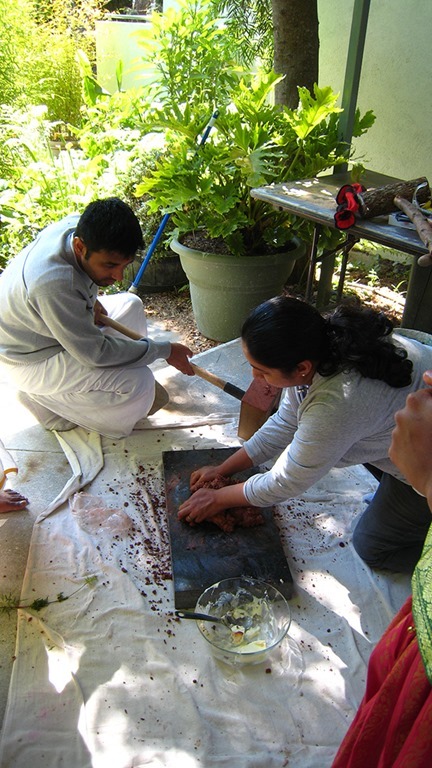 Five pairs of hands beat the initially dry ingredients into a lump resembling a smooth chunk of asafoetida. 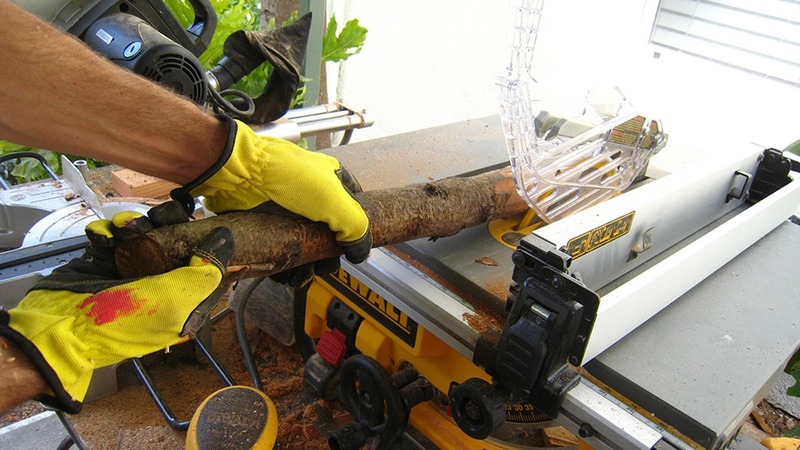 As the process progresses, the mixture acquires a waxen consistency. 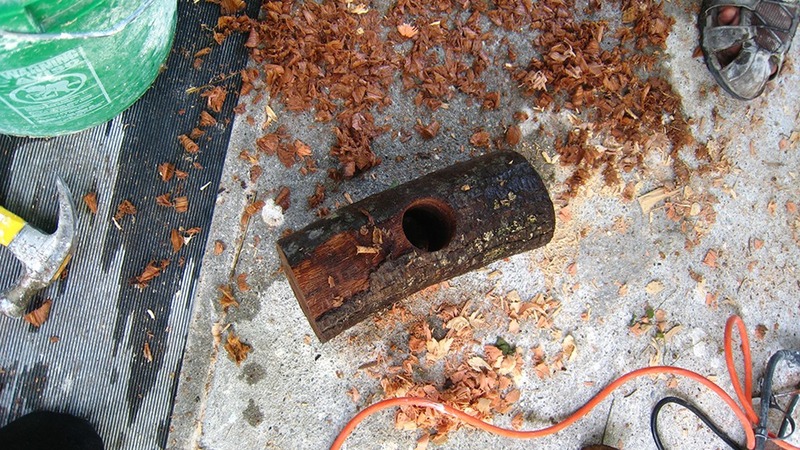 The use of the tamarind wood for the hammer gives the necessary heat during the hammering process which aids the formation of this colloidal mixture. This is later made into smooth pebble-like balls which harden as they cool. The second and the more important phase of ashtabandham takes place at the temple where these balls are put through some more hammering to restore the dough-like texture. Once this consistency is attained, the mixture is ready to perform its role of the mortar binding the idol to the pedestal. This is what is termed as the ashtabandha kalasam which is an elaborate three-day long ritual at the end of which the idol is firmly fixed. 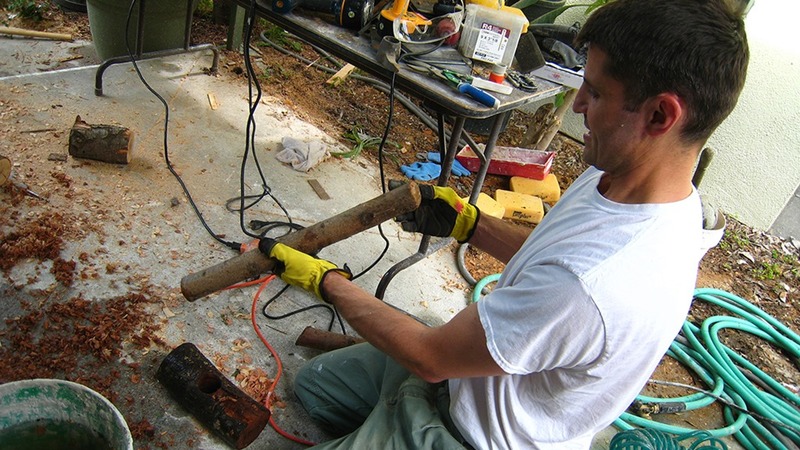 Earlier, Scott prepared mallets to use in pounding the Ashtabandham. 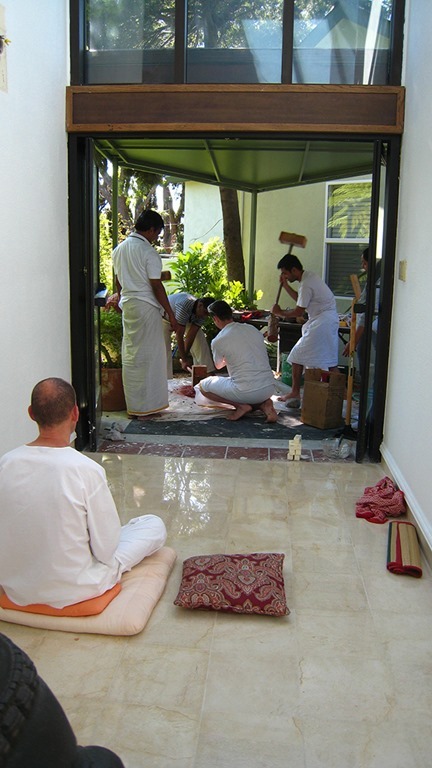 Directly outside the front temple entrance, Ashtabandham is prepared for the Siva Lingam. Here Jaya places the Ashtabandham on a granite slab ready for pounding it soft. The granite proves to be too small so the Ashtabandham is moved onto thick plastic. 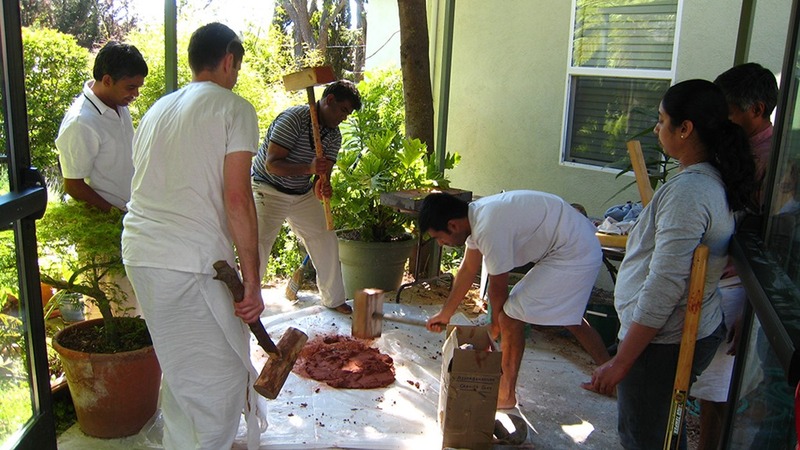 Here, Scott, Raman, Siva and Gnana takes turns pounding the Ashtabandham. Nome looks on while pounding goes on. It takes some time to get the Ashtabandham to the proper consistency. 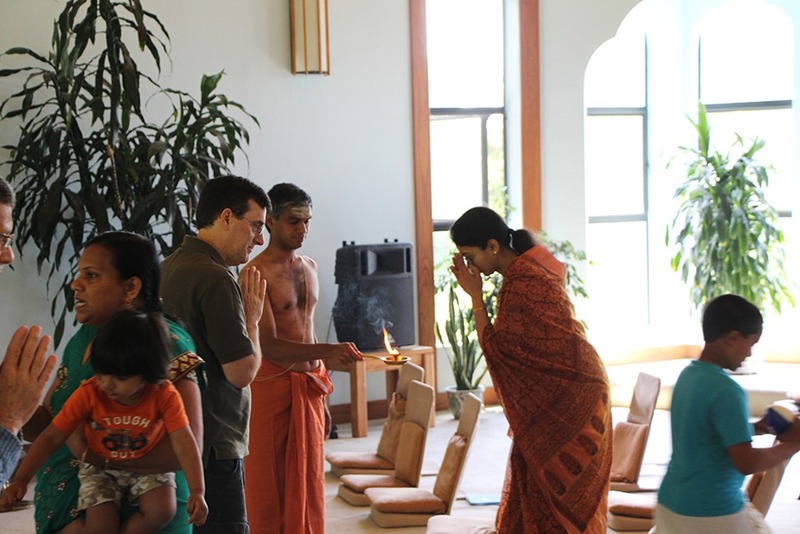 Ganesh, Gnana and Scott apply the Ashtabandham while everyone present fervently chants Sadisvara Gayatri. 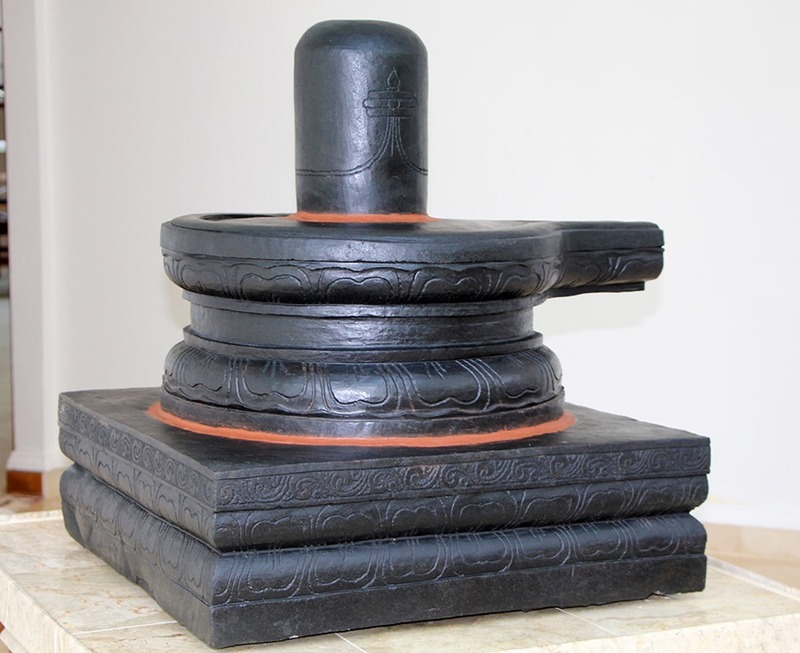 Sri Sadisvara Siva Lingam complete with Ashtabandham. Om Namah Sivaya, again and again! Next…the first abhishekam to the Siva Lingam, and altars are made and installed for Ganesha, Skanda, Sivakami, Balipitam & Chitragupta.